I’ve been battling a cold all week, the kind where you just feel crummy but you can’t just cancel everything and curl up on the couch with a blanket and Netflix. So while normally I would say that the perfect makeup for sick days is no makeup, sometimes you just don’t have that option. You may have to go to work, or you may just get tired of walking past a mirror and seeing dark circles and a red nose. Whatever you’re reason, here are some simple ideas for makeup that will make you feel a bit more human on days when it takes a lot of effort to act like one. First rule of sick day makeup: Moisture. Drink plenty of water and slather on a good face cream. Sickness, especially colds, can leave you feeling dehydrated and tired, and your skin will show it. Carry a large bottle of ice water with you all day and try to drink twice as much as you normally would. I also recommend finding a good decaffeinated tea (caffeine will add to the dehyration). My absolute favorite right now is the Celestial Seasonings Honey Vanilla Chamomile tea. It smells softly sweet and soothing, and I have had at least two cups every day for the past week. The steam and warmth can really soothe congestion and throat irritation. Second rule of sick day makeup: Hydrating Products. For makeup, try a BB cream, such as Physician’s Formula Super BB All-In-One Beauty Balm Cream. This will provide coverage and add moisture. If you don’t like BB cream, then go with a hydrating and luminizing primer, such as Maybelline Master Prime Blur + Illuminate primer, and a medium coverage foundation. My recommendation to choose medium coverage may seem odd–our first impulse is cover, cover, cover. But I suggest light to medium coverage because chances are, if you have a cold, it will wear off around your nose and break up differently than normal, and a lighter coverage foundation will make this less visible. It will also allow your skin to breathe, great when you’re feeling feverish or clammy. Finally, it’s less likely to cling to dry patches or look flat, so your skin will actually look better with less coverage. I also recommend a good medium coverage hydrating concealer. My favorite is the Physician’s Formula Super BB All-In-One Beauty Balm Concealer. (If you want to try the Physician’s Formula BB products, try this set–it is nearly half the price of buying them all separately. I’ve done a full review of this kit here.) This concealer works well on redness and dark circles, is super hydrating, and is easy to throw in your bag for touchups throughout the day. Another good option is the Maybelline Instant Age Rewind Dark Circle Treatment Concealer. Don’t take away that hydrated look with too much powder: Just set your T-zone. Use the least dry powder you own, For me, that’s the Physician’s Formula Super BB All-In-One Beauty Balm Powder. (I promise, this isn’t a sponsored post. These are just great, hydating products.) If you have oily skin, use blotting papers throughout the day, but avoid the urge to pile on the powder. Third rule of sick day makeup: Add some strategic shine. 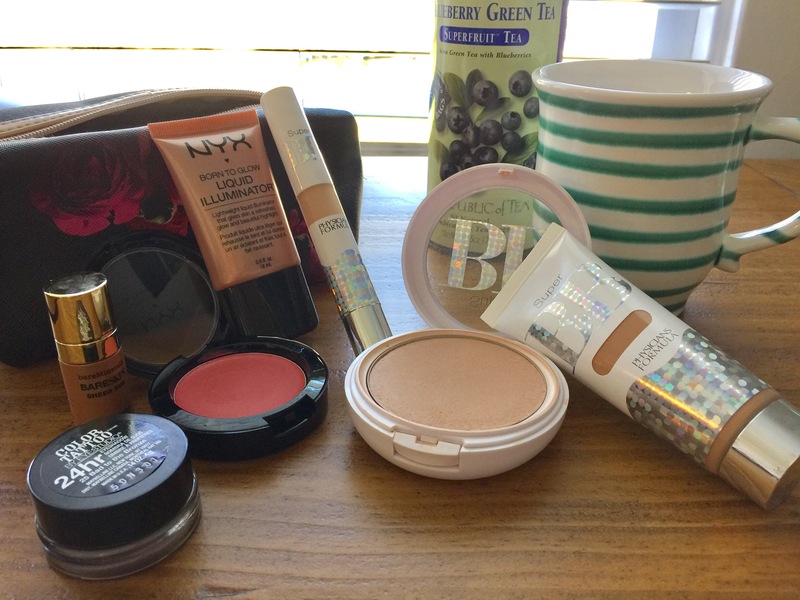 Even though I typically use powder products, for days when I have a cold, I prefer creams or liquids. I recommend the BareMinerals Bare Skin Sheer Sun Serum Bronzer, dabbed on with a makeup sponge or stipple brush. Next, tap on a cream blush, such as the NYX Cream Blush, with your fingers or a stipple brush. This blush is nearly waterproof and has great staying power. Finally, pat a liquid highlight, such as the NYX Born to Glow Liquid Illuminator, on your cheekbones and temples. If you normally put highlight on your nose and lips, I’d avoid it this time. Without getting into too much detail, let’s just say that if you have a cold, that’s not an area you want to look moist. Fourth rule of sick day makeup: Go natural and polished on the eyes. You want to avoid exaggerating any darkness or puffiness, so simplicity is key. Again, I suggest cream products with a little bit of shine. I chose a lighter and darker shade of the Maybelline Color Tattoo shadows, the lighter on the lid and darker patted in the outer corner and only halfway in the crease to avoid adding more darkness. Add a waterproof mascara in case you have watery eyes, and go natural on the brows with a tinted brow gel like Essence Make Me Brow, or even a clear brow gel like Ulta EyeBrow Gel. Fifth rule of sick day makeup: When you can, take it off and pamper your skin. When you get home from work or are just ready to call it a day, take off your makeup and put on a hydrating sheet mask. My favorite is the Tony Moly Hyaluronic Acid Hydrating Sheet Mask. The cooling sensation will help alleviate cold symptoms, and it will also add moisture back to your skin that was lost throughout the day. I hope you don’t have many sick days, but as we enter cold season, I hope this helps you for those days when you’re just not feeling like yourself. Do you have any tips or remedies for dealing with colds? I’m always on the lookout for ways to feel a little more human. Thankfully I haven’t had a sick day in months! I guess drinking green smoothies daily really does pay off! I used to drink them all the time, then somehow got out of the habit. I need to do it again–do you have a recipe you like? I bought this book called the 10 day green smoothie cleanse by JJ Smith and she has tons of recipes in there! They’re really good.